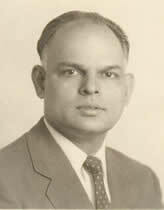 The lectures were founded in memory of Professor Pillai, who joined the Purdue faculty as Professor of Statistics and Mathematics in 1962. Previously he was a Senior Statistical Advisor for the United Nations. In this capacity he founded the Statistical Center at the University of the Philippines. His chief contributions to statistics were in the field of multivariate statistical analysis. His leadership in statistical research (more than 80 published papers) was recognized by his being named a Fellow of both the American Statistical Association and the Institute of Mathematical Statistics. April 27, 2018 - John D. Lafferty, Yale University, "Fruit Flies in Statistics and Machine Learning"
April 8, 2016 - Runze Li, Pennsylvania State University, "Projection Test for High-Dimensional Mean Vectors with Optimal Direction"
April 25, 2014 - Peter J. Bickel, University of California - Berkeley, "Nonparametric Inference for Unlabeled Graphs"
March 23, 2012 - Yazhen Wang, Department of Statistics, University of Wisconsin-Madison, "Quantum Computation and Statistics"
April 22, 2010 - Susan Murphy, University of Michigan, "Individualizing Dynamic Treatments: Statistical Challenges and Some Solutions"
October 22, 2007 - Donald B. Rubin, Harvard University, "Principal Stratification for Causal Inference with Extended Partial Compliance"
September 21, 2006 - Michael Stein, University of Chicago, "Statistical models for spatial processes on a global scale"
May 14, 2004 - James O. Berger, Duke University, "Objective Prior Distributions in Multivariate Normal Settings"
March 21, 2002 - John Marden, University of Illinois, Urbana, Chicago, "Iterated Multivariate Ranks - Truly Nonparametric Procedures?" April 12, 1996 - B.L.S. Prakasa Rao, Indian Statistical Institute, "Spatial Data Analysis"
April 24, 1991 - Lawrence D. Brown, Cornell University, "Non-existence of Good Unbiased Estimators in Singular Problems"
To make a contribution to the Pillai Memorial Lecture Fund, which funds this lecture series, please visit our Giving page.